1. Cook the potatoes in a pan of boiling water until tender. Drain, mash well and allow to cool. Mix with the rest of the ingredients (except the oil) and season to taste. With wet hands, shape into 15 small patties and chill for at least 30 minutes. 2. Make the relish by mixing all the ingredients together, then chill until you serve the fritters. 3. Pour 0.5cm oil in a deep, non-stick frying pan. 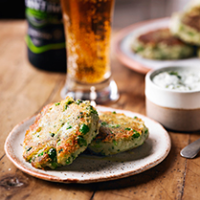 Fry the potato cakes in batches, adding more oil if needed, over a medium-high heat for 2-3 minutes on each side until golden, crisp and hot in the centre. Drain on kitchen paper. Serve warm with the relish.